The Fairfield Lady Lions softball team looks on from the dugout between innings on Tuesday at West Union High School where they battled the Lady Dragons in SHAC competition. 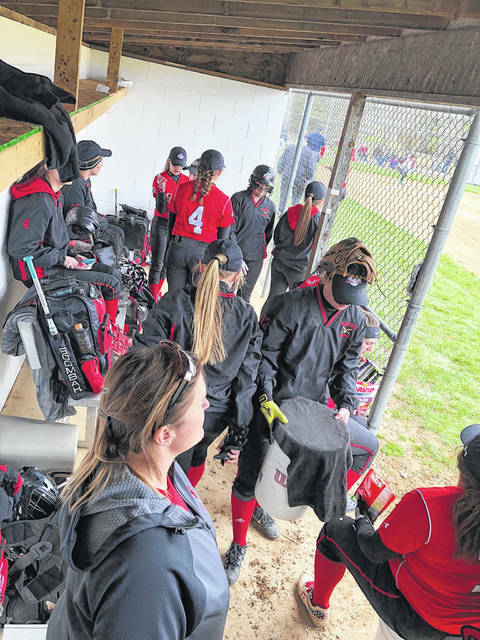 The Fairfield Lady Lions (6-1, 4-1 SHAC) picked up their second Southern Hills Athletic Conference victory in as many days blanking the West Union Lady Dragons (0-4, 0-4 SHAC) by a score of 15-0 on a cloudy and cold day at West Union High School. Kaiti White and the Fairfield Lady Lions were dominating again this afternoon as White struckout 13 of the 17 batters she faced in the two hit shutout while the Fairfield Lady Lion defense played errorless defense. The Lady Lion offense had 8 hits while scoring 15 runs. Fairfield got the scoring underway in the top of the third inning, scoring 7 runs. Taylor Lawson had the big hit in the inning, a double over the left fielder’s head to knock in two runs. The Lady Lions scored another 2 runs in the top of the fourth inning and finished the scoring with 6 big runs in the top of the fifth inning. Kaiti White, Layla Hattan, and Lyndee Spargur had key hits in the inning. Kaiti White was brilliant in the circle at one point striking out 10 consecutive batters en route to her fifth shutout victory of the still young season. Leading hitters for the Lady Lions: Lyndee Spargur (2 for 3, 2 runs, 3 rbi), Carli Reiber (0 for 2, 2 walks, 1 run), Kaiti White (1 for 4, 3 run, 1 rbi), Layla Hattan (1 for 4, 2 run), Lauren Arnold (1 for 2, 1 run), Taylor Lawson (2 for 3, double, 2 runs, 2 rbi), Molly Thackston (1 for 3, 1 run), Megan Gragg (0 for 1, 2 walks, 2 runs, 1 rbi), Madi Fox (0 for 3, 1 run). Kaiti White (6-1) was the winning pitcher for Fairfield. Kaiti’s Pitching line: 5 innings, 2 hits, no 1 runs, no earned run, no walks, and 13 strikeouts. Maci Shoemaker (0-4) suffered the loss for West Union. Shoemaker’s pitching line: 5 innings, 8 hits, 15 runs, 7 earned runs, 11 walks, and 3 strikeouts. The Fairfield Lady Lions (5-1, 3-1 SHAC) defeated the North Adams Lady Devils (0-4, 0-3 SHAC) in a Southern Hills Athletic Conference game played at the Fairfield Baseball/Softball Complex. The game was played on a cloudy, windy, cold day, with game time temperature of 41 degrees. The day was cold, but the Lady Lions’ bats were hot, pounding out 13 hits in the five inning contest with five different Lady Lions having multiple hits. Kaiti White and the Lady Lions defense dominated their opponents limiting the Lady Devils to a single earned run on four hits. The Lady Lions against played errorless defense. Leading hitters for the Lady Lions: Lyndee Spargur (2 for 3, 3 runs, 3 rbi), Carli Reiber (1 for 2, 1 run, 1 rbi), Kaiti White (2 for 2, 1 run), Layla Hattan (1 for 3, 1 run, 2 rbi), Lauren Arnold (2 for 2, double, 1 run, 3rbi), Ashley Sanderson (1 for 3, 1 run), Molly Thackston (2 for 3, double, 1 run, 2 rbi), Megan Gragg (2 for 3, 1 runs), Madi Fox (1 for 2, 2 run, 1 rbi). Kaiti White (5-1) was the winning pitcher for Fairfield. Kaiti’s pitching line: 5 innings, 4 hits, 1 run, 1 earned run, no walks, and 7 strikeouts. Macey Jarvis (0-4) suffered the loss for North Adams. Jarvis’ pitching line: 4 innings, 13 hits, 13 runs, 13 earned runs, 4 walks, and 2 strikeouts. Fairfield’s baseball team traveled to West Union on Tuesday to take on the West Union Dragons in a SHAC game. The Lions took the lead in the first inning and looked like they were in position to pick up the victory as they led 8-5 heading into the bottom of the seventh inning. The Dragons plated four runs in the seventh to register the come from behind win 9-8. Fairfield head coach Jeremy McGraw pointed to errors and free bases as the difference in the game. “This was a tough loss. We led the entire game and did a great job of adding insurance runs in the top of the seventh. Give credit to West Union, they are a solid ball club. We had some costly errors and to many free bases. Against a good team like that, they make you pay. It is never easy going on the road. We are getting everyone’s best and we need to be able to be consistent. Our guys will bounce back,” McGraw said. Sam Buddelmeyer had it all working at the plate and on the base paths in the game as he went three for three in the game. Buddelmeyer also contributed three RBI and scored two runs of his own. Matthew Spears recorded the loss after pitching six and two-thirds innings. Spears allowed eight runs, five earned, in the game while striking out four. He walked five batters and allowed seven hits. The loss marks the lone blemish on the Lions’ SHAC record (5-1) and moves them to 5-3 overall on the season. Lady Lions Assistant Coach Tom Purtell contributed to this story.